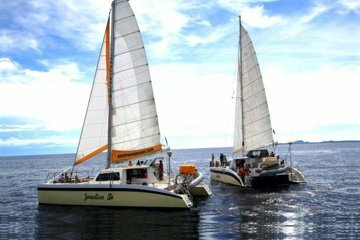 Naviguez à bord d'un catamaran vers plusieurs des meilleurs sites de plongée en apnée de Curaçao lors de cette visite de 4 heures au départ de Willemstad. Matériel de plongée en apnée fourni, déjeuner barbecue et open bar inclus. Rendez-vous au restaurant Pirates Nest, situé dans le carrefour de Caracasbaai à Jan Thiel. Rendez-vous avec votre guide et votre groupe à 9h30 pour un départ à 10h00. Montez à bord du catamaran et installez-vous pour une balade pittoresque autour du lagon espagnol, peuplé de méga yachts et de maisons de luxe. Puis naviguez en mer ouverte pendant environ 20 minutes vers le premier site de plongée en apnée, connu sous le nom de "Underwaterworld". Nagez le long des rives du Caracasbaai puis sous une jetée pour admirer une vue magnifique sur le dépot, où vous pourrez voir des colonnes de coraux et des hippocampes, parmi d’autres animaux marins. De retour sur le bateau, participez à un barbecue avec des boissons du bar ouvert sur le chemin menant au deuxième site de la journée, le remorqueur submergé. Faites de la plongée avec tuba pour voir les poissons tropicaux colorés qui ont ramené le remorqueur à la maison. Faites le plein avec une collation de fruits tropicaux sur le chemin du retour au port. We took our extended family of 10 infant on the tour. The 4 children had a blast. The snorkeling was good, but not the same experience as at Playa Grandi or Playa Lagun. Crewmen Mousi and Paul were most helpful. Everyone loved the barbecue. The only criticism would be the tour of expensive beach villas at the beginning. But, our whole family really had a great half day. Awesome day! Captain Eugene and his crew took excellent care of all of us! The catamaran was well maintained and it was smooth sailing the entire time. The views of Spanish Waters were beautiful and both snorkeling sights had wonderful things to see. The lunch and drinks they provided were delicious too. We live on Curacao and will do this sail again when friends come to visit! Nothing fancy but all fun! ! ! We were cruise ship passengers and didn't find an excursion that we liked through them, so I went online, found Bounty Adventures, and so glad I did! Our guide, Anna Maria, was very organized, informative, and couldn't have been sweeter. Once onboard, Captain Clifton safely sailed us past beautiful waterfront homes and resorts out to our first snorkel spot. There, we spent approximately 45 minutes in the beautiful blue waters of Curaçao while Anna Maria lead the way and pointed out all of the fish, even diving down to pick up sea urchins and bringing them to the surface so that we all could see it! We saw the most fish at this spot. After getting back onboard, Captain Clifton took us to the second snorkel spot for a shorter visit. Never did we feel rushed, and if one didn't want to actually snorkel, you could stay onboard or jump off the catamaran and swim right there. When the second snorkel was over, we had the most delicious bbq lunch prepared by Mr. Poi, who is a lifelong Curaçaoan fisherman and will share some great stories, if you ask him! If you're looking for a fun, leisurely half day on the water in Curaçao, we highly recommend this excursion and would definitely do this one again. From booking it online to the actual excursion itself, things couldn't have gone smoother. Anna Maria, Captain Clifton, Mr. Poi, and Mousie made it a great day in Curaçao for us! This was a phenomenal excursion!! We had THE BEST time! Would definitely recommend this trip. It wasn't overly crowded and we were a party of 8. The food served was excellent and the crew were AMAZING! Thoroughly enjoyed this trip and would definitely book again if ever back in Curacao. We've taken several of these types of excrsions over the last few years and this was the best. The groupsize was just about right. Not the overcrowded mob we've had on others. The food for lunch was quite good with more than the usual choices and plentiful as well. More than enough for everyone. We really enjoyed the snorkeling. Now, we are what I'll call amateur snorkelers. I suppose advancded or diehard snorkelers might not share the same perspective. In this case, the tour guide actually got in the water with us and led us on a tour pointing out the various fish, etc. and even swimming under a rather large structure. Then there was the obligatory fish feeding over a sunken boat that was quite cool as well. We actually did sail for a short while without the motors which I wish was longer but it was still enjoyable. Bottom line, I'm glad we did this and I'd do it again. Two great snorkeling spots, fantastic BBQ lunch. The best catamaran cruise we have been on, captain and crew were outstanding. Highly recommended, a must do trip. This was an overall great trip! They were willing to pick us up from the cruise port, so that was handy....but we had to be picked up about an hour before the actual tour due to several more resort pickups that we had to do on the way to the embarking location. Once we got there, we went through the check in process and were told to wait to wait for about 5 mins to board. The crew back and forth and our 5 min turned into more like 20. When we finally got on board, they apologized and told us the boat was not clean and ready for us, so that's why we were late. The boat has a small restroom and galley, places to sit under/inside the boat, outside, and they allow you to sit out front on the lattice webbing. The tour started in a channel/bay sort of area where we went past some homes and resorts on the water. We pulled the boat into a dock to pu another party at a resort and then went back the way we came. This seemed a bit redundant, so it was hard to know when the tour actually started. We finally got going and the small jib sail was put up and the engines turned off. It was a beautiful day for sailing.....so peaceful and relaxing....except for the boat's music blaring......ruined the mood. I could have asked for them to turn it off, but the crew seemed to enjoy it so I didn't. We were told that we would snorkel at 2 places. 1 was known for unique coral, the other more so for the fish. This was a really great treat as we got to see some unusual sites. It was also an area that was not filled with tons of other tours and snorkelers. I don't know if it was the time of day, or if this was more of an unknown spot. We snorkeled under an old pier near the fort for about 1/2 hour or so. If you have never snorkeled, I would encourage anyone to try it on this trip however don't use the life vests as they are not the snorkel vest that you can adjust with air so they don't allow you to truly get your head underwater. We've snorkeled before, but I wanted to mention how great the crew was with everyone. One of them was down in the water and showing/telling us what to look for. If anyone needed help, got tired, needed a hand, he was there with his life ring or rope or hand. It was never needed, but for those who are scared to try snorkeling.....this was the perfect time to try it. We were also assured that this side of the island was very safe and you'd never see a shark! After all were back on the boat, an awesome grilled bbq lunch was served. Chicken, ribs, pork chops, a few salads and bread. A few specialty drinks were available, wine, soft drinks and water. We then went on to the next spot to snorkel. This spot was a lot of fun as there was a sunken tugboat with a lot of fish swimming nearby, in and around. That pretty much finished our trip as we made the trip back to the dock. Although we had gotten a late start, I believe we got our full 1/2 day of time. I would give 4 1/2 stars as overall this was a great experience with just a few minor things lacking.